Happy Monday! I’m starting to settle into my new routine. After getting back from vacation 3 weeks ago, starting school and going back to work, I’ve been really off my game. I just couldn’t figure out how to do homework, blog and film videos and keep it all consistent. I think I’ve finally gotten settled into a weekly routine, and I hope that means that I’ll start blogging 5-6 days a week again. 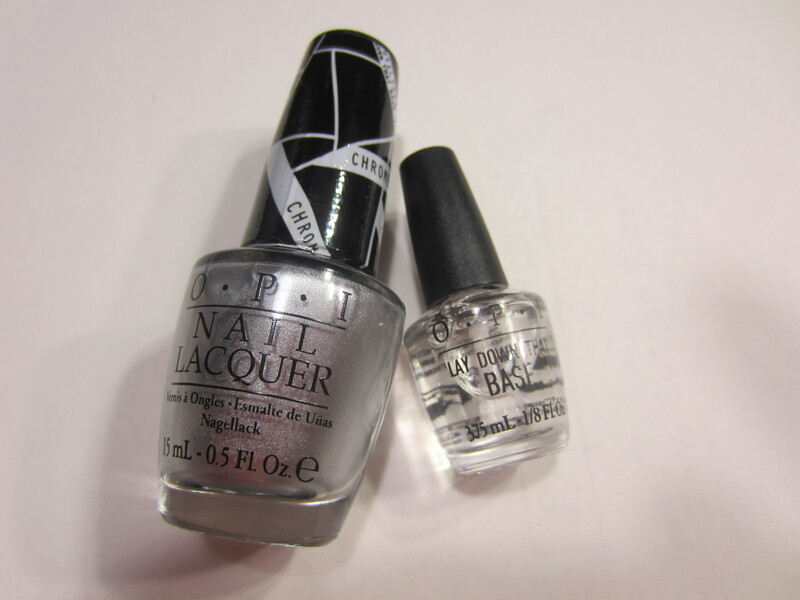 Today I’m showing you guys a new polish from the OPI Gwen Stefani collection. When I first saw promotional materials for this collection, I wasn’t interested at all. I still wasn’t interested when I saw swatches online. It wasn’t until I saw Dani, from Life in Polish, post something on instagram. That was when i finally figured out that I needed this in my life! OPI “Push and Shove” is a chrome polish! That’s right, pure chrome! It reminds me of those Sally Hansen chrome colors that were in stores when I was a kid. I had the silver one and actually used the entire bottle. This polish is seriously like mirrors for your fingers! How this polish works is a little tricky. It comes with a special base coat, show above, that is called “Lay Down That Base.” When I first got this polish I assumed that it was crap … a waste of money and I wouldn’t need it … that I could still use my regular base coat with this polish. Umm, NO! If you use this polish over anything besides the special base coat it looks horrible! It gets chunky, it cracks, its patchy, its awful. Even if you put down your regular base coat and then a layer of the special base coat it does that too. The only way to use this is with 1 coat of LDTB on bare nails. The next little weird thing is that you can’t use a top coat. Trust me, I tried. The first time I used it I assumed that it would be like textured … that it doesn’t really do much but make it look better. Umm, NO! It completely dulls the finish and makes every brush stroke stand out even more! It makes it look like the worst frosty finish silver polish. So skip the top coat. The last weird thing is that OPI says this is a polish for one night only. I think that would turn a lot of people off from this polish because why would you spend all this money when it only lasts for a day. I’m happy to announce that while OPI was right about the base coat and top coat, this polish does last longer than just 1 night. It won’t last forever, as you can’t use a top coat with it, but it did last on me for 3 days without a chip and without getting dull. Ok, if you’re still reading this super long post, I commend you. But I do have to say that the formula on this polish was hit and miss. Like I said above, you can’t really use your normal base coat or the formula will be a nightmare. When you use it as instructed, it goes on really smooth and opaque. This is 2 coats over LDTB and without a top coat. And you can see, it shows every imperfection in your nails. I even buffed my nails before putting this on. The dry time is amazingly fast so this can be a great polish for running out the door. Overall, I’m in LOVE! This is so cool and I hope that OPI releases this in gold, rose gold and copper because I will buy them all! What do you guys think? Did any of you pick this polish up too? ← Top 10 Nail Polishes for Winter! I am still on the fence about this, but I’m totally with you, if they release rose gold and copper I will be ALL over them! From her collection this is the one i want!